I’m on my way to Italy this week for my annual pilgrimage to Ravenna, Italy and the LEX Summer School put on by the University of Bologna. This is my fourth trip to the class. I always find it so inspirational to be a part of the class and the activities that surround it. This year I will be talking about the many on-going projects that we have underway as well as talking, in depth, about the HTML5 editor I built for Akoma Ntoso. Before I get to Italy, I wanted to share something I’ve been working on. It should come as absolutely no surprise to anyone that I’ve been working on producing a version of the U.S. Code in Akoma Ntoso. A few weeks ago, the U.S. Office of the Law Revision Counsel released the full U.S. Code in XML. My company, Xcential, helped them to produce that release. Now I’ve taken the obvious next step and begun work on a transform to convert that XML into Akoma Ntoso – the format currently being standardized by the OASIS Legal Document ML technical committee. I am an active member of that TC. About 18 months ago, I learned of a version of the U.S. Code that had been made available in XML. While that XML release was quite far from complete, I used to to produce a representation in Akoma Ntoso as it stood back then. My latest effort is a replacement and update of that work. The new version of XML released by the OLRC is far more accurate and complete and is a better basis for the transform than earlier release was. And besides, I have a far better understanding of the new version – having had a role in its development. My work is still very much a work-in-progress. I believe in openly sharing my work in the hope of inspiring other to dive into this subject – so I’m releasing a partial first step in order to get some feedback. Please note that this work is a personal effort – it is not a part of our work with the OLRC. At this point I’ve written a transform to produce Akoma Ntoso XML according to the most recent schema released a few weeks ago. The transform is not finished, but it gives a pretty good rendition of the U.S. Code in Akoma Ntoso. I’m using the transform as a vehicle to identify use cases and issues which I can bring up with the OASIS TC at our weekly meetings. As a result, there are a few open issues and the resulting XML does not fully validate. I’m making 8 Titles available now. They’re smaller Titles which are easier for me to work with as I refine the transform. Actually, I do have the first 25 Titles converted into Akoma Ntoso, but I’ll need to address some performance and space issues with my tired old development server before I can release the full set. Hopefully, over the next few months, I’ll be able to complete this work. 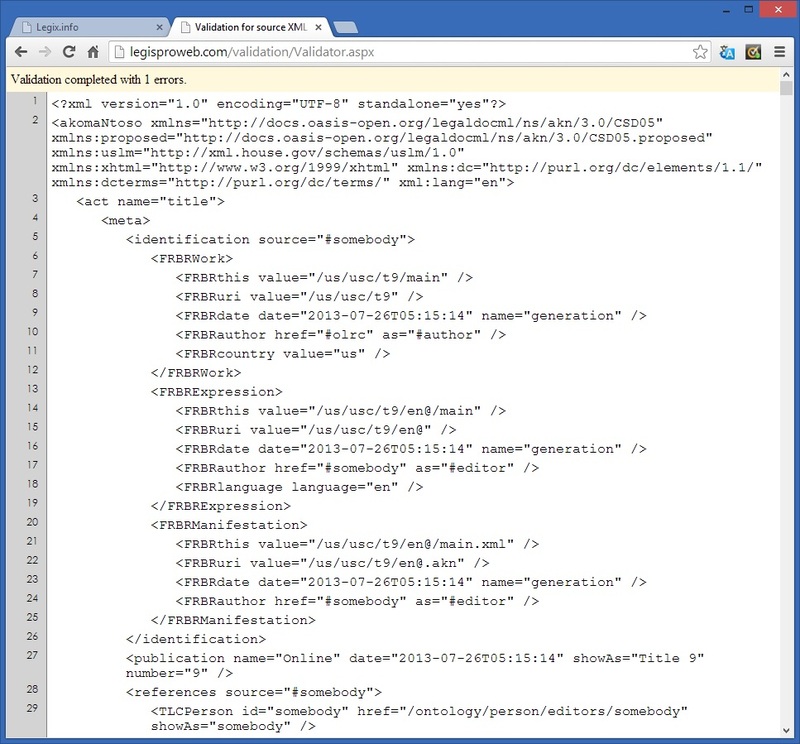 When you look at the XML, you will notice a “proposed” namespace prefix. This simply shows proposed aspects of Akoma Ntoso that are not yet adopted. Keep in mind that this is all development work – do not assume that the transformation I am showing is the final end result. I’m looking for feedback. Monica, Fabio, Veronique, and anyone else – if you see anything I got wrong or could model better, please let me know. If anyone finds the way I modeled something troubling, please let me know. I’m doing this work to open up a conversation. By trying Akoma Ntoso out in different usage scenarios, we can only make it better. Don’t forget the Library of Congress’ Legislative Data Challenge. Perhaps my transformation of the U.S. Code can inspire someone to participate in the challenge.